Some people hoard stuff; I hoard recipes. I will rip them out here and there along the way, filing them in a big old box that I keep in my living room. Now and again I'll browse through it and set aside a few I'd like to try. This particular recipe never even made it to the box. 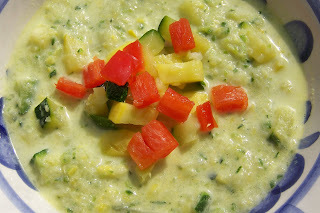 I LOVE zucchini, and I knew I'd be using this squash bisque recipe quite soon. The chopper made quick, perfect, precisely-diced work of 5 zucchini in, oh, about 30 seconds. In a word: AAAAAAAAAAWESOME!!! 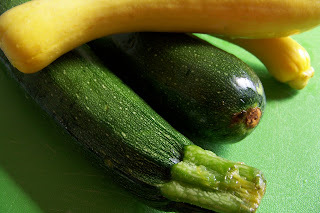 Once I finished playing with my chopper, I realized I had wayyyyy more zucchini than I needed for this recipe. I set some aside after a few minutes of sautéing, and kept cooking the rest. While the zucchini cooks quite quickly, I have agree with the author of the NYT post on this recipe: the zucchini doesn't really brown! Once you can really smell the zucchini, it's done. I halved the recipe and sort of fudged my way along (more fractions!) and I think it all turned out quite nicely. I also used white pepper instead of black--it's one of my favorite ways to spike the flavor in a dish. I also didn't purée the soup as much as I could have, so it really felt more like a 'chowder' than a bisque, which was just fine with me! I like my soup to have some heartiness to it. I want to feel like I'm EATING something, not just 'drinking' my food. I also took some of the zucchini I reserved earlier, while it still had some crunch to it, and put some of that on top of the finished dish. I also added a few dices of red pepper just for color, but I didn't care for the bite this had when mixed with the mellowness of the zucchini. Looks pretty, but I'll skip it next time around! Also, don't let the cream content freak you out: it's 1/3 of a cup for a good 6 hearty servings--you're only getting a few tablespoons. This dish was suprisingly light and refreshing. I didn't feel heavy or too full after eating it. And I have plenty of leftovers for the days ahead. Excelsior!! I love bisques but never tried a squash one - sounds delicious! Thanks for a great idea! Great post! 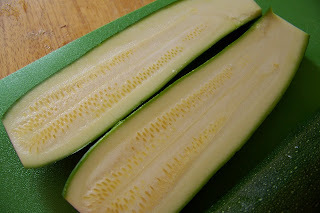 This time of year, squash is so cheap - a lot of people get it for free from their gardens and their neighbors' gardens too, of course, so this post is perfectly ripe and in season. Thanks for sharing!